Given the special love vintage collectors and fans have for Yankee teammates Roger Maris and Mickey Mantle racing to beat the Babe's home run record in 1961, it's pretty cool that Maris himself appeared on a #5 from that year. And what else says BOOM to a kid like BAZOOKA gum? Roger's power didn't come out of nowhere, as he averaged ~20 homers in Cleveland and KC prior to reaching New York. The cozy Bronx fences boosted that to 39 homers and an AL-leading .581 slugging in 1960, numbers that could've been higher if he'd played every day (career stats at B-R.com). 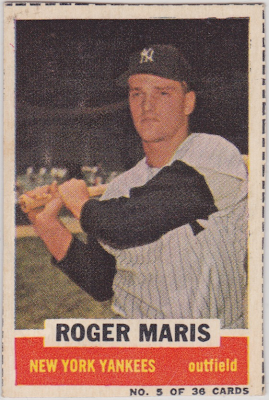 After setting the new 61-homer mark in 1961, Topps gave Roger the prestige spot of 1962 #1. Value: Low-grade Bazooka stars cost $15-20 and commons run a few dollars. 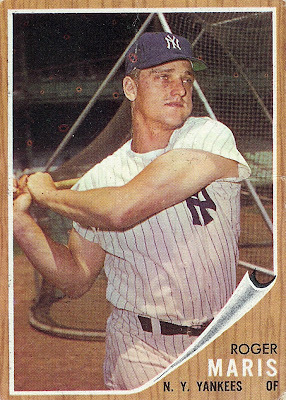 Fakes / reprints: 1961 fakes probably exist, given Bazooka's basic cardboard stock and blank backs. Look to buy from sellers that have a spread of vintage from that era, rather than just stars like Maris, or stick to commons for your type collection. Still the home run champ in this baseball fan's eyes. Such a tragic story, though. Definitely a guy who left the game (and us) too soon.